The beauty of the Myrtle Beach area is that it is within a day's drive of many major metropolitan areas. Washington D.C., for example, is roughly 450 miles away. Automobile is the primary mode of transportation for visitors to the Myrtle Beach area, as a number of vacationers like the close proximity from their hometowns to the Grand Strand. U.S. 501 leads into the heart of the Myrtle Beach area. 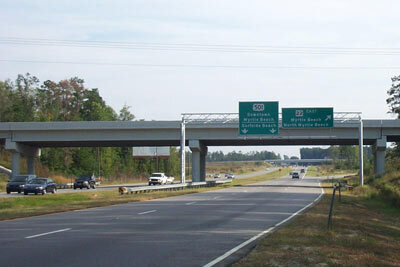 There are a number of other highways to navigate the area, such as the U.S. 17 Bypass, S.C. 31 and S.C. 22. A new overpass is being built at the intersection of the U.S. 17 Bypass and Farrow Parkway to help ease congestion at one of the Myrtle Beach area's busiest intersections. It is expected to open in August 2014. For more information: Myrtle Beach Driving Distances on VisitMyrtleBeach.com.